"Are you washed in the blood ?" Have you been to Jesus for the cleansing power ? Are you washed in the blood of the Lamb ? Are you fully trusting in His grace this hour ? Are you washed in the blood of the Lamb ? Are you washed in the blood, In the soul cleansing blood of the Lamb ? Are your garments spotless ? Are they white as snow ? Are you washed in the blood of the Lamb ? Are you walking daily by the Savior's side ? Are you washed in the blood of the Lamb ? Do you rest each moment in the Crucified ? Are you washed in the blood of the Lamb ? 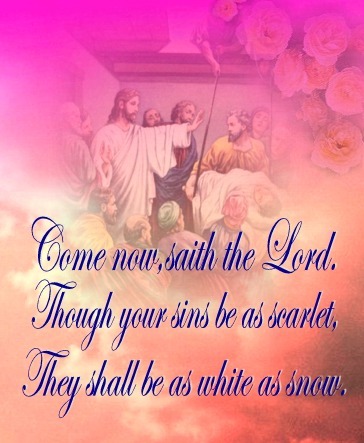 When the Bridegroom cometh will your robes be white ? Are you washed in the blood of the Lamb ? Will your soul be ready for the mansions bright, And be washed in the blood of the Lamb ? There's a fountain flowing for the soul unclean, O be washed in the blood of the Lamb !